Gov. Larry Hogan’s Regulatory Reform Commission is recommending a massive overhaul of Maryland’s “convoluted” governmental structure along with a host of small and medium-size changes to streamline regulations and focus state employees on helping businesses and citizens. 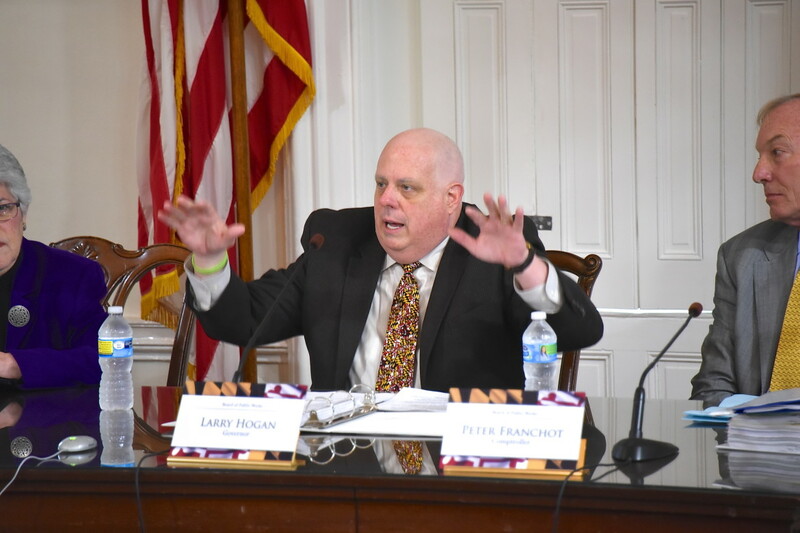 “We have to fundamentally change the mindset of the state’s regulatory mission from one of glaring bureaucracy looking to punish and change it into a customer service base,” Hogan said as he touted the commission’s initial 30-page report at the Board of Public Works meeting Wednesday. “We want to change the entire culture of state government to one of customer service … to change the mindset that you’re guilty until proven innocent,” the governor said. Hogan admitted he and his staff “haven’t had the opportunity to review” all of the commission’s recommendation yet, but he clearly liked what he saw. Hogan set up the commission in July to deal with one of the biggest complaints he heard on the campaign trail, “even more than taxes are too high” — that Maryland regulatory process is slow, cumbersome and unresponsive compared to Virginia’s. “We heard it over and over and over again,” Hogan said. So did the 11-member commission, getting an earful from more than 450 citizens who came to more than 24 hours of hearings at six locations across the state, according to the commission chairs. In addition, the commission website got more than 200 comments and suggestions. The first part of the report quotes dozens of these witnesses by name, mainly government officials and business representatives. Gov. Marvin Mandel reorganized Maryland government 45 years ago, and it needs a redo to bring the state into the 21st century, the report says. Updating “antiquated” technology that makes it difficult for agencies to share information with each other or businesses. Quicker and more definitive responses to all plans, applications and forms. Joint work groups to speed up review of major development projects. Customer service and the lack of it was a consistent theme. The commission also acknowledged some progress that 10 state departments had already made in implementing some of its recommendations. While the commission took a broad overview of some problems and issues, it also delved into specific regulations that needed change. Cemetery owners voiced concern about the fees being charged, both for licensure as well as per burial. Mortgage lender licensing was outdated and overlapped new federal rules. State procurement should be more centralized. The commission even got into regulations for vineyards and food trucks. State requirements for food vending trucks were even higher than those for restaurants and “unreasonably burdensome,” such as banning the sale of most food on state roads, yet permitting the sale of seafood and flowers. So, just as reducing unnecessary spending is important to improving Maryland’s fiscal health, so too is eliminating unnecessary or unduly burdensome regulations.